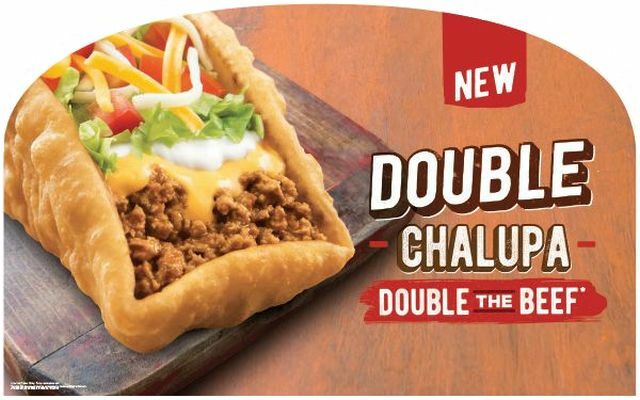 The test item features a larger, boat-like deep-fried Chalupa shell filled with double the normal amount of seasoned beef plus nacho cheese, reduced fat sour cream, lettuce, 3-blend cheese, and tomatoes. The Double Chalupa being sold for $3.49. There's also a spicy version with jalapenos added for the same price. Additionally, it's available in a "Big Box" combo that also includes a Crunchy Taco, a Doritos Locos Taco, and a medium drink for $5. If the concept sounds familiar, Taco Bell once offered something similar called the "XXL Chalupa" back in 2010. It included much of the same ingredients but with the addition of tortilla strips and pico de gallo (which they called "fiesta salsa" back then). According to this Reddit thread, the Double Chalupa has been spotted in Taco Bell restaurants in the Milwaukee area.